A black and white photograph of Halton MPP Jim Snow and Lt/Gov. 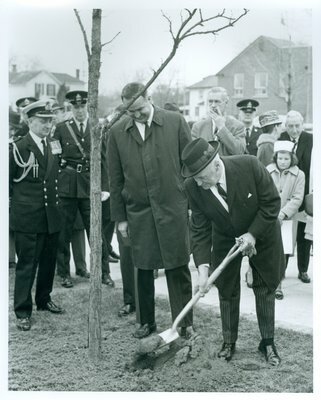 Rowe planting a White Oak Tree during the opening ceremony of the Oakville Centennial Centre. The tree was donated by Hazel Matthews in memory of William Chisholm. Appears in the Daily Journal-Record Dec. 11, 1967 with the caption "WHITE OAK TREE PLANTED ON SITE / Halton MPP Jim Snow and Lt/Gov. Rowe". Appears in The Beaver Dec. 14, 1967 with the caption "PLANTS CHISHOLM OAK TREE".